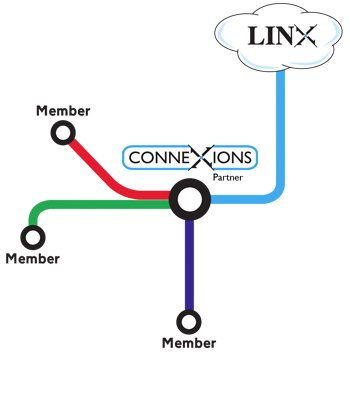 The LINX ConneXions programme means you can connect to LINX from anywhere on our network and you no longer need to take space in a LINX data centre or take connectivity to the LINX exchange! Quick, easy and cost effective! Simply join LINX, select the port connection you want and we can connect you the same day your LINX membership application is approved. You must submit an application to join LINX, we will manage this as part of your signup process. LINX membership applications take just 3 days to process. Once approval is received, we put your port live the same day! * – Note that 100G availability is limited dependent on location. Do I need to have equipment in London? Will I still be a proper LINX member? Can I use the LINX Route Servers? We actively the encourage the use of the route servers and as a member you would be required to connect to the router collector. Yes, we can aggregate multiple 1G or 10G ports and traffic will be balanced between them. Is there a contract length to being a LINX member? There is no contract length to being a LINX member but a 30 day notice period is required when cancelling. Please note that the channel partner may implement their own minimum terms. Can I easily upgrade the bandwidth? No, we guarantee a 1:1 contention ratio on our ports so you will always receive the true port speed you have signed up for. We charge a one off setup fee of £850 plus VAT for your connection (we reserve the right to charge additional fees for 100Gig ports). After this you simply pay your monthly port fee and LINX membership fees which we take in advance by Direct Debit. Which Peering LANS do you offer? LINX operate two peering LANS. The primary LAN is known as the “Juniper” LAN whilst the secondary LAN is the “Extreme” LAN.